New benches installed at Gore Park have an armrest two-thirds of the way along that serve to deter sleeping; advocates wonder if this a deliberate measure against the homeless. It's impossible to lie down and sleep across the length of one of the new benches installed in Gore Park, thanks to an armrest two-thirds of the way along the bench. It's a design feature that has advocates who work with homeless people in the core wondering if the benches are the city's first use of so-called "defensive architecture." That's the term given to design features like the controversial installation (and deinstallation) of spikes in Montreal , that deter or prevent homeless people from sleeping or otherwise congregating in a certain place. "I think it discourages the use of the park for a vulnerable population who often have no where to go when the shelters send them out the door in the morning," said Frances Jewell, executive director of the local Mental Health Rights Coalition. "It looks like it's to discourage people from lying down on a bench." The park's landscape architect said there's not an explicit anti-loitering intent behind the design of the 20 new benches. But Greg Tedesco, a community developer with the Social Planning and Research Council of Hamilton who's done homeless outreach, wonders if the benches achieve a desired effect. "Gore Park is a place where people congregate," Tedesco said. "Is there a subtle message that's a part of that, in terms of that public space? Who do we want to congregate there?" The issue of loitering and other "nuisance behaviours" flared up in 2014, as downtown boosters asked the city to make downtown feel safer and friendlier for business people. The redesign of Gore Park's central block, between James and Hughson streets, opened Sunday and features new walkways, lighting, trees and greenery in addition to the new benches. Downtown Coun. Jason Farr said many stakeholders worked for years on all of the details around "animating" Gore Park. 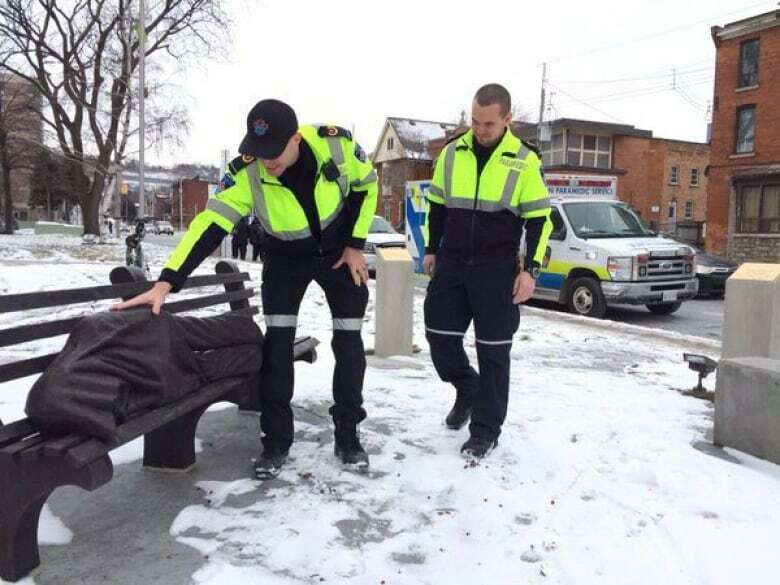 "I'm sure their reasoning was that they were picturing benches as places to sit, not places to lie down," he said. "We probably think about sitting down having lunch, sitting down having a conversation." He said the park is to be enjoyed by everyone, but suggested that if someone is in a vulnerable position, he hopes the city's social navigator or other outreach workers are able to find that person and offer some help. Tedesco has worked with people without stable places to sleep, and says it's given him a lens through which to see decisions that seem to add up to exclusiveness. "Working with people experiencing homelessness, you look at these places a little bit differently," Tedesco said. "When you see that bench as a potential place to lay down if you don't have anywhere else to, then it becomes a lot more real to them." There are a few other places where the seemingly anti-loitering benches are. Along King William Street, there are a couple. But the new ones along the waterfront? No extra arms. Meghan Stewart, the city's landscape architect on this project, wasn't yet working on the project when the orders were placed for furniture, but found in looking through records that over seven years of consultations, additional seating at the park was a big part of what the community wanted to see. The bench was chosen in part because it creates obvious places for three people to sit, Stewart said. Two people can sit on one side of the extra arm, and one on the other. "The arm also provides an arm rest for each person on the bench which is more comfortable for many people," Stewart said. "I wonder if I would see three strangers sitting on a bench like that," she said. "To my mind it is a rather passive-aggressive message. It speaks very loudly to me." Stewart said the records for the park planning "didn't say anything about it being a deterrent" but that safety was a major concern brought forward in the consultation. "There's nothing specifically about deterring anyone from being in the place." But Tedesco said sometimes even unintentional decisions can have an impact of exclusion. "Gore Park historically has always been a meeting place, a place where people hang out. People might take a nap there, they might rest there," he said. "It might not be a fully intentional thing, but I think it's important to examine the barriers that are there. The design of it doesn't allow anybody to lay down on it."